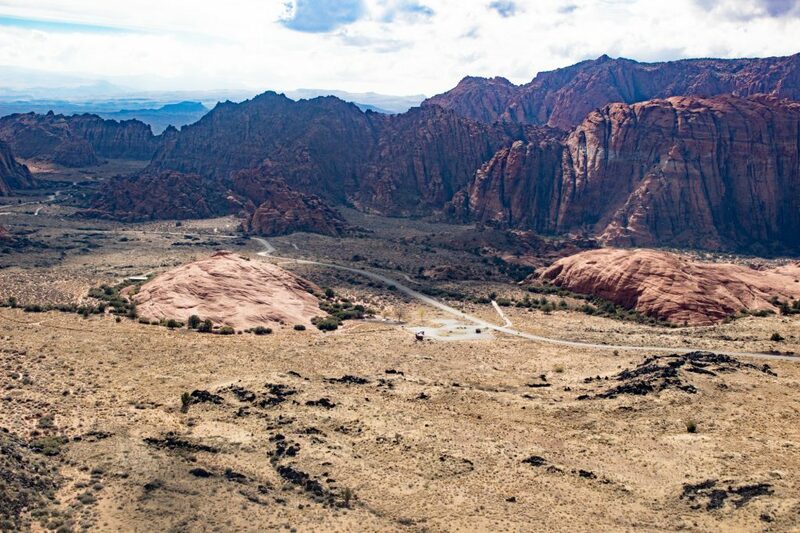 WASHINGTON COUNTY – A surprising act of vandalism was discovered amid the white Navajo sandstone of Snow Canyon State Park in recent weeks. A person or persons hiked over a mile into the park from the White Rock trailhead and into a remote area where they spray-painted the rock. 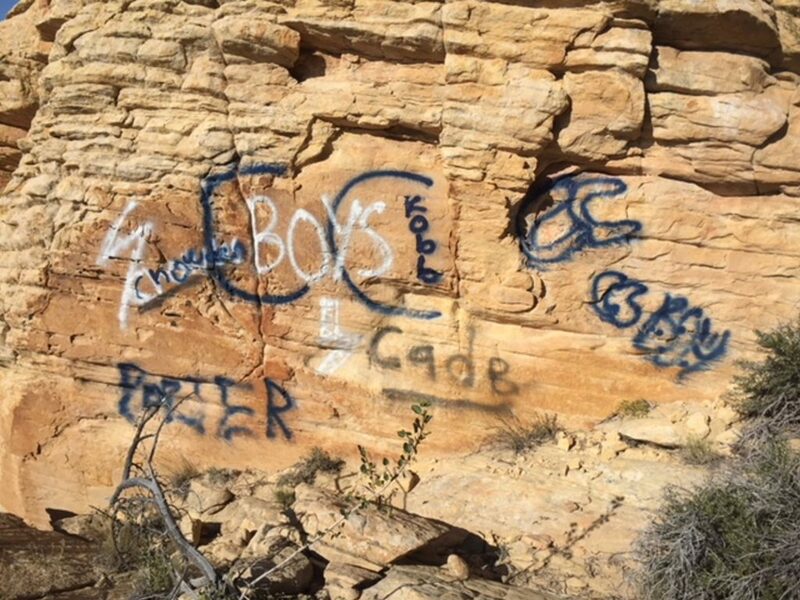 Kristen Comella, Snow Canyon’s park manager, said the graffiti was discovered a few weeks ago by a volunteer trail steward who took photos and shared them with park staff. 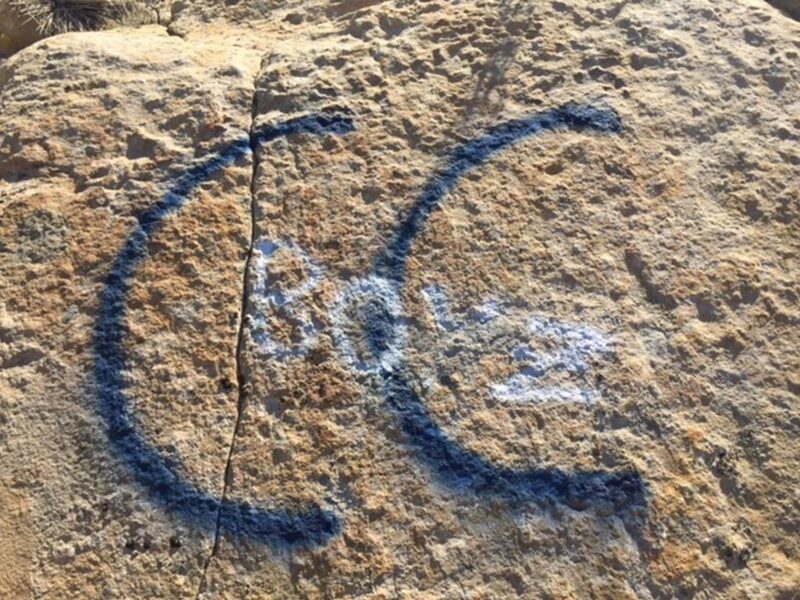 Words, names and numbers were sprayed on the rocks in at least two different colors, which Comella said could be school colors, though authorities are still investigating the situation. 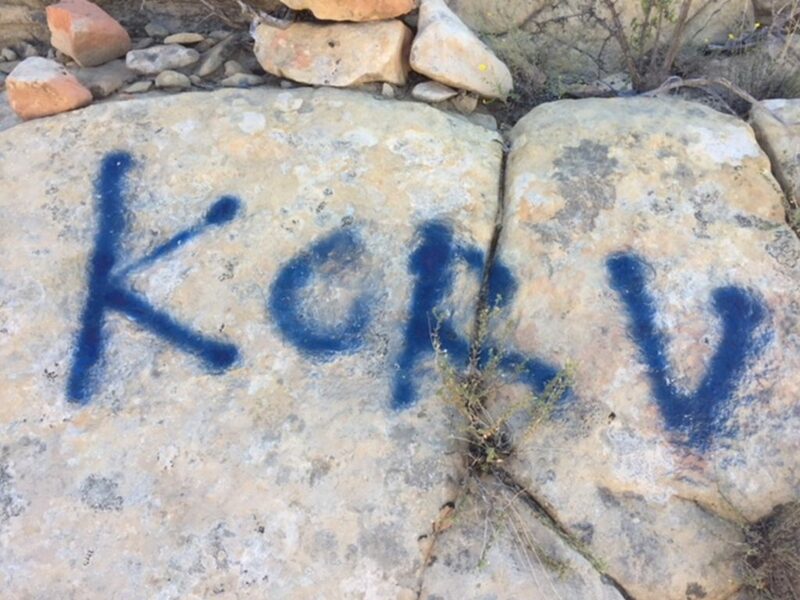 “Korv” “Eadk” “CC” “Fibby” and other words and names sprayed onto the rock with blue, white and black spray paint. Whatever significance the may have, if any, remains unknown at this time. 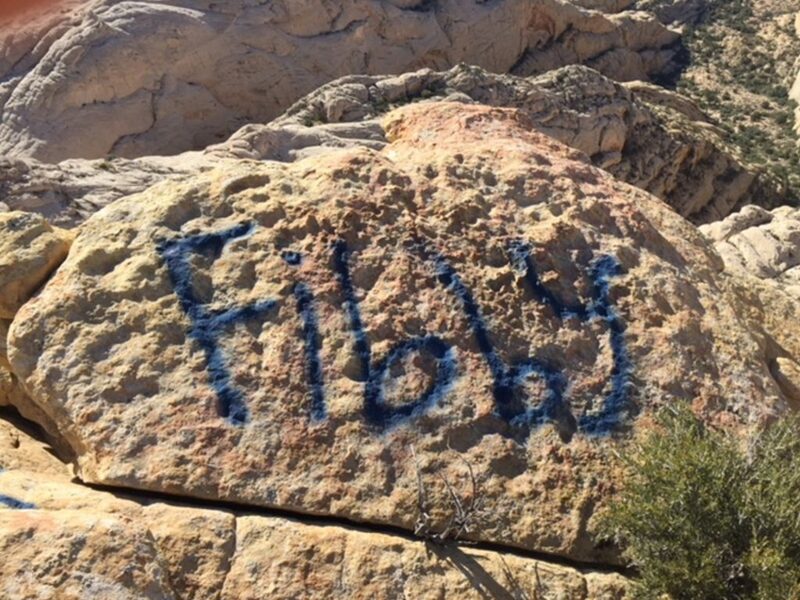 While some acts of vandalism have risen with increasing visitation over the last 10 years, it usually takes the form of people scraping their names on rocks with other rocks, or carving their names into the park’s sandstone formations. The park staff has tools they use to clean up and repair the damage, but spray paint is a different matter. Another aspect of the incident that has surprised park staff is that this appears to be a premeditated act. Most acts of vandalism are done as the opportunity arises, Comella said. Someone on a trail may pick up a rock and start carving away on some sandstone nearby and little more. 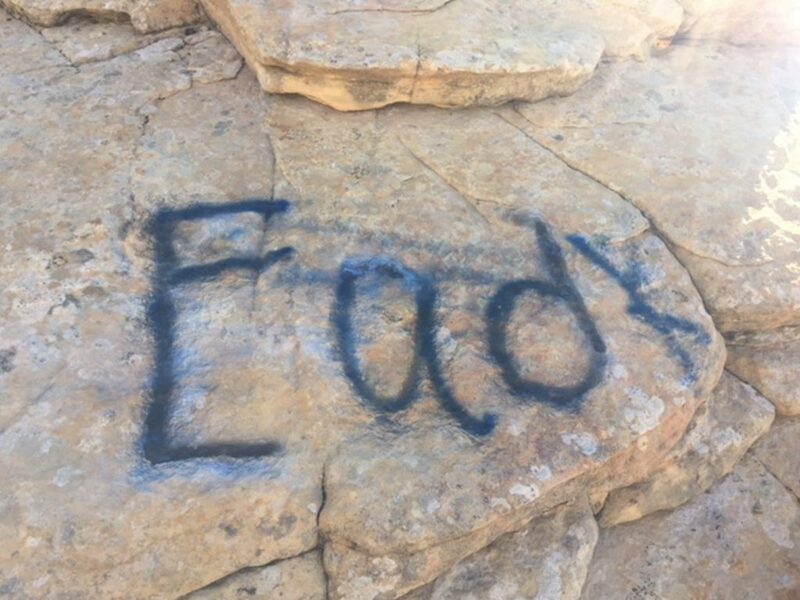 In this case, a person or group went through the effort of bringing materials with them into the park and hiking over a mile into a remote and not-so-easily accessible area in order to deface public land. “That definitely takes planning and premeditated effort, which isn’t typically what we see,” Comella said. The first of what will be multiple cleanup efforts is planned for late November. 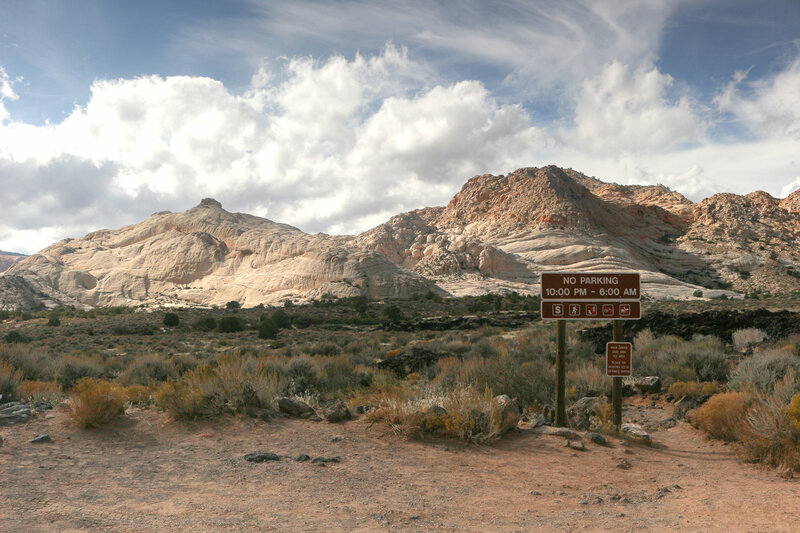 Anyone with information concerning this incident is encouraged to contact the park at 435-628-2255 or through e-mail at snowcanyon@utah.gov. Penalties for defacing land within a state park can include possible fines and being made to participate in cleanup efforts, Comella said. It takes money and a lot of time to remove the damage. 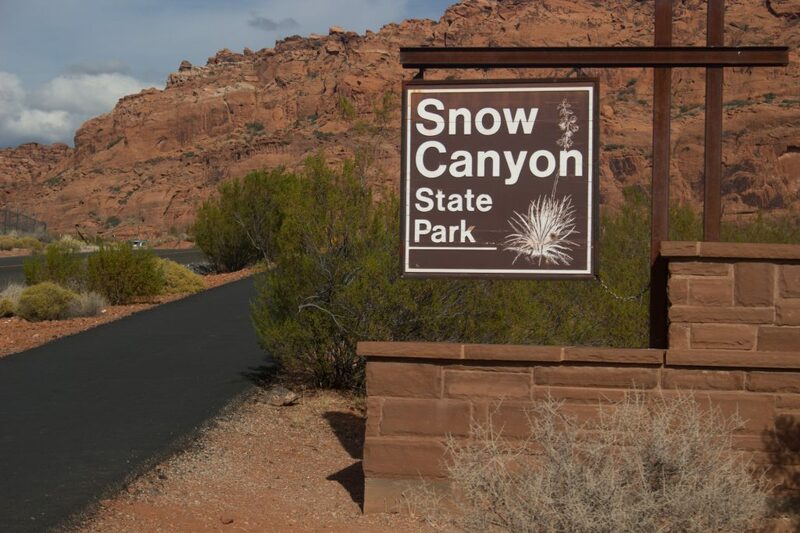 Snow Canyon State park is the third largest of Utah’s 45 state parks and typically ranks among the top 10 visited state parks year after year. These are the acts of punks. Ill-bred, wannabe thugs who unwittingly place shame on their parents and force them to share the burden of their out of control off spring. How tragic for the parents and how stupid of their kiddies. It’s more than likely “street names,” of local gang-bangers. This display of vandalism seems inconsistent with typical graffiti strikes…..it is so remote and not readily visible by others. I am sure we can rule out tourists, especially rock climbers, who might use this area for recreation. My guess is these idiots will have filmed their exploit, and post it on social media. Plenty of local low-performing high school kids to choose from. At least Banksy’s murals had an artisticelement……….. I would hope that the Park/State would offer large cash rewards leading to the arrest of those JackA@$ that the perps would have to also pay back as part of their sentencing. Maybe one of their friends would secretly turn them in for the $.